Hubbell is addressing the needs and interests of both disparate sides of the aging curve — both seniors and millennials — with a couple of its newer wiring devices. First, on the “seniors” side, Hubbell’s new LED-illuminated nightlight family of products combine the function of wiring devices with the convenience of nightlights. 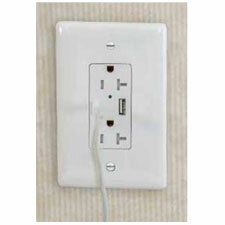 The devices really are nothing more than a standard outlet cover or switch plate the includes an LED so that a hallway, bathroom or even storage room or closet can be automatically illuminated after dark, helping seniors and/or those with poor night vision to see outlets, walls and switches more easily in the dark. The devices use photo cells to automatically turn on and off depending on available ambient light, and since they are part of the outlet plate, do not occupy outlets that may needed while replacing bulky nightlights that can be easily damaged and need replacement. The devices consume between 0.5 and 1 watt each, and are available as duplex tamper-resistant receptacles, decorator switches and decorator outlet plate nightlights. “Light in critical areas minimizes trip hazards and falling,” notes Vic Flagello, a Marketing Director at Hubbell. On the millennials side of the aging coin, Hubbell now offers new wall outlets called “USB Charger Outlets” that include USB connections in addition to the standard double receptacle three-prong electrical connections. Hubbell’s USB Charger Receptacles can be USB Type-C, USB Type A&C or Type A, but all are compliant with USB BC1.2 Battery Charging and 3.0 Power delivery, and compatible with USB 2.0, 3.0 and 3.1 devices. Designed for home, commercial and industrial use, the charger outlets are rated to 10,000 cord insertions and removals, and a clear nod to the proliferation of USB-charged smartphones, pad devices and other electronics throughout the home. White Button™ NM cable Connectors…Easy, push in installation from Inside or OUTSIDE an electrical box!